The final challenge of the Excorcist...nothing can satisfy her unholy hungers! Beyond the terror of "The Exorcist," "The Amityville Horror" and "The Omen" lies a sadistic female demon called Haggia THE POSSESSOR! When Peter an archeology student opens Haggia's cursed medallion, her spirit immediately takes control of him and begins a hellish assault on his loved ones. Peter's girlfriend Sherry, his sister and mother soon fall prey to Haggia's twisted carnal advances. And when Peter undergoes the hideous sexual transformation into Haggia, his family has but one recourse: Brother Erasmo The Exorcist. 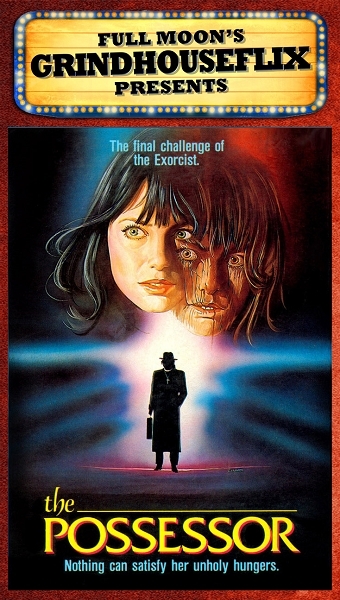 Before long, there ensues a frenzied battle between good and evil that escalates to a literally eye-popping, blood curdling climax that outshocks "The Exorcist"! Viewers beware: once THE POSSESSOR snatches your soul, you will never be the same!